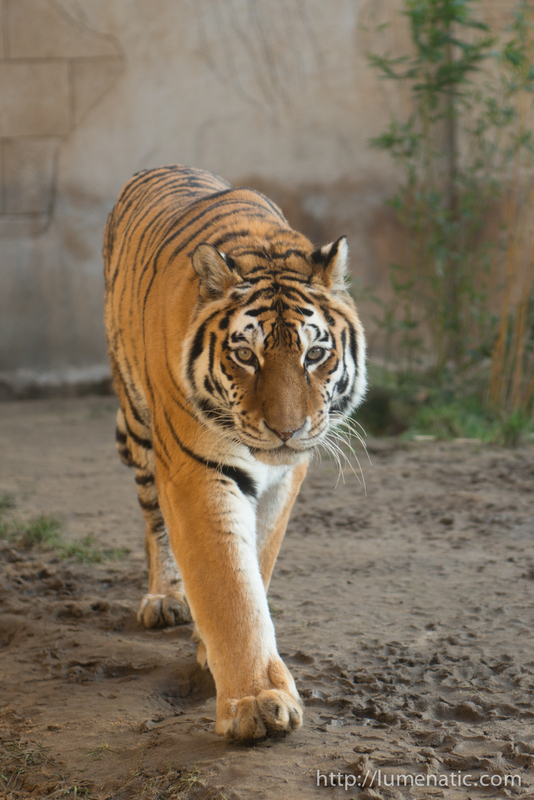 In lack of freely roaming tigers, lions and other game here in Hanover I often go to the fabulous zoo. We have a 12 month pass and so we can go there as often as we like without having to worry about the duration of the stay. I always take a camera with me and capture the majestic animals (last time we went my wife rolled her eyes when I packed my camera. “Tell me – is there a point when you have enough pictures of those animals ?”. I blinked and looked at her in total lack of understanding. “I don’t understand… what do you mean when you say ‘enough pictures’ ?” That did not compute). Ok jokes aside. Today I want to share some experiences when shooting animals through glass windows. The first hassle are reflections in the glass window. Light sources in the background or people standing next to you are always happy to reflect in the glass window and show up on your images. You can minimize those disturbances by wearing dark clothing, it will reflect less than lighter clothing. Now it is winter and I wear a long black coat, that works pretty well usually. The second tip is to bring your lens as close as possible to the glass, so that the camera sees only a minuscule portion of the complete glass wall. Be careful not to touch the glass with your lens to avoid damage (of the lens…). I sometimes also use a polarizer to eliminate the reflections. But when shooting indoors (ape house e.g.) I prefer to use every single photon which can reach the sensor, so for me a polarizer is only an option outdoors. The rest s done in post. 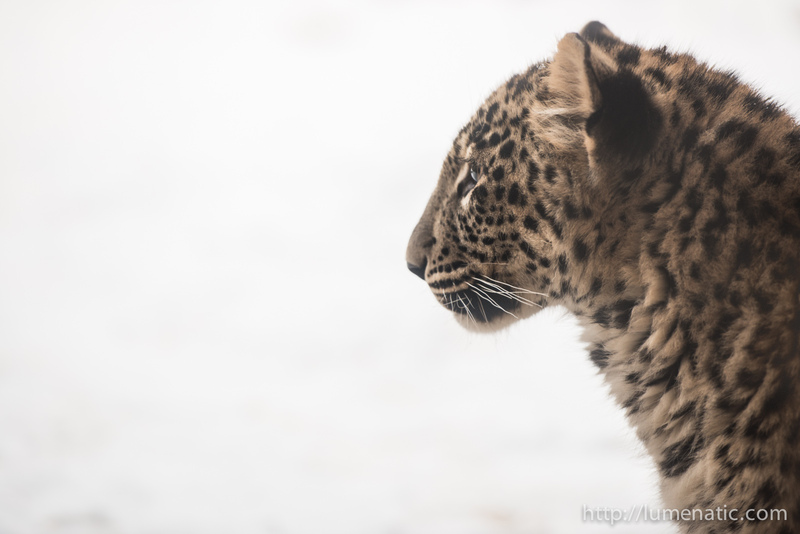 Observe these two images I made of a leopard in the snow. Both images were shot through a glass wall. You can see that the original is somewhat milky, hazy, low on contrast and the colors just don’t pop. That is due to a very scratched and dirty window, the legacy of hundreds of hands and noses leaning against the glass. Thank god for raw files and Lightroom ! Heighten the contrast, increase saturation, add some clarity, adjust white balance… and there you have it. Some images do not need many corrections, such as these pictures. The tiger picture only received some saturation boost and got cropped. The leopard below just got some contrast correction. But wait ! 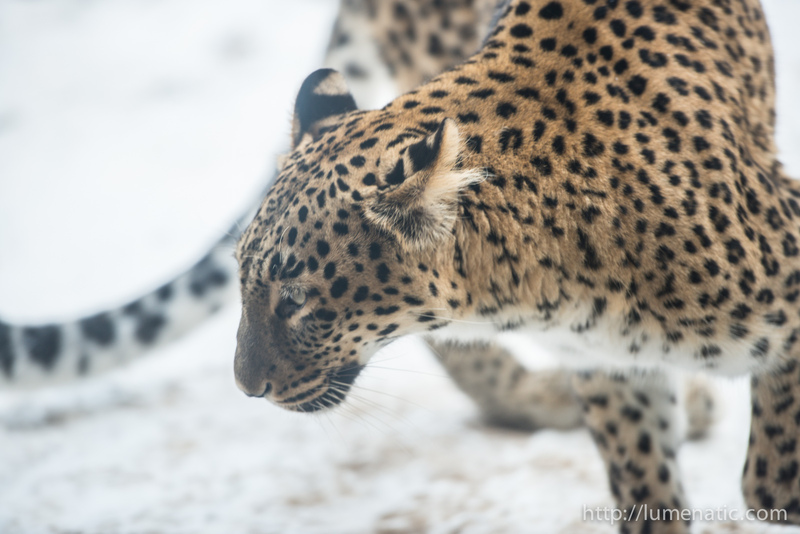 See the yellowish stripe on the top left corner of the leopard image ? Darn, it could have been such a nice image, but that is a reflection. What you see there is part of a gateway to the outside which is behind me. It is much brighter than its surroundings, thus it heavily reflects in the glass window. 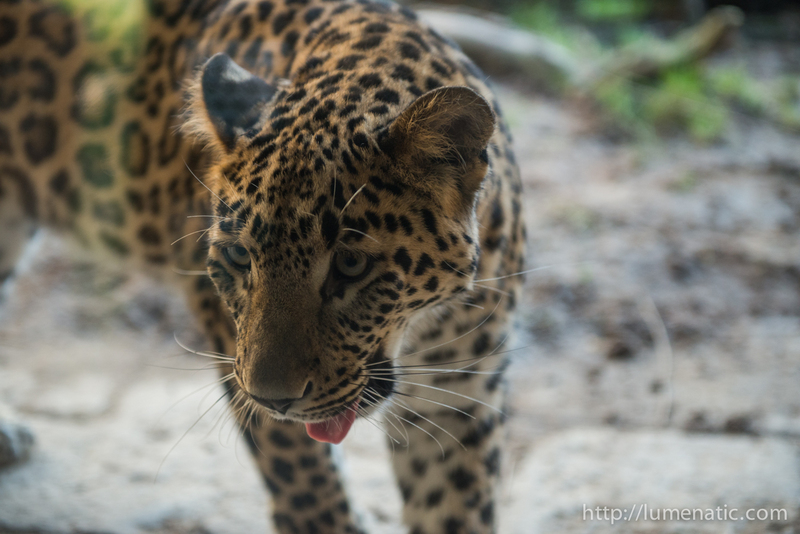 Let’s take a look at another image I made in the zoo. I encountered that hippopotamus in a lucky situation. There were nearly no people around which could reflect in the glass or stand in the way (I had to shoot from 2-3 m away since the hippo was directly at the glass wall). And just in that uncrowded situation, which is uncommon for a big zoo, the hippo swam towards the glass and posed for me. 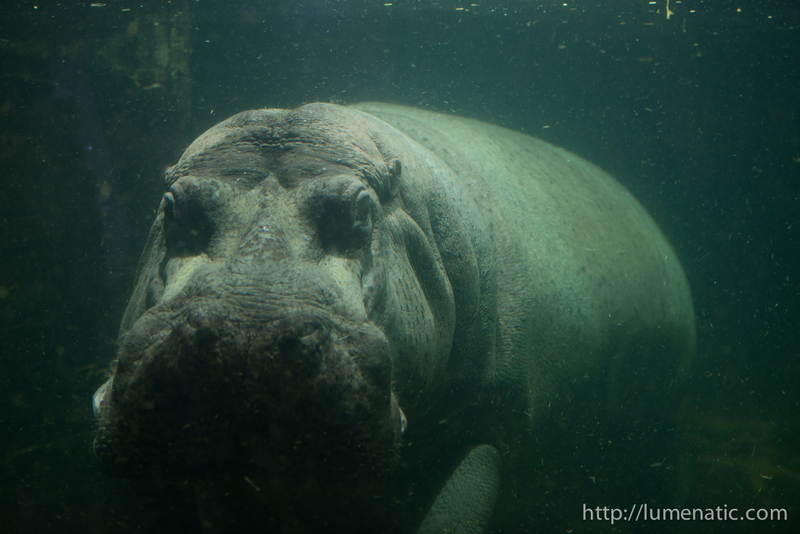 Two seconds later – hippo turns around and swims away. Kind of a right-time-right-place-image. The image received only a tad of contract correction, but only a homeopathic dose. There is a slight reflection on the left part of the image (purple-ish stripe going from the snout to the upper left image corner), but in that case the reflection does not disturb the image heavily in my opinion. If you shoot animals through glass you have to worry about reflections and loss of contrast due to scratched or dirty windows. Reflections can be minimized by bringing the camera close to the glass, using a polarizer or hoping for a situation and angle that does not produce any reflections. Wear dark clothing, it has the tendency to reflect less in windows than light clothing. Low contrast and boring colors can be fixed in post. And, as always when it comes to photographing animals, bring patience.